6.0	Politics and Justice without borders: Canada and the U.S. 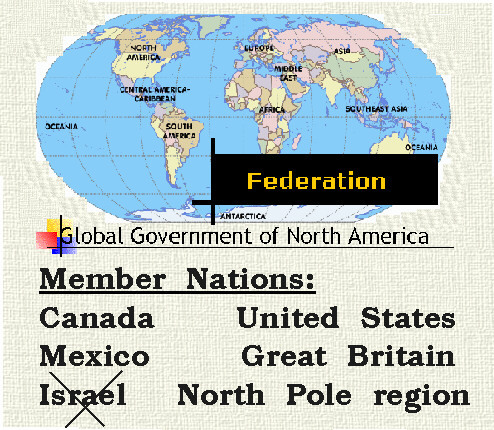 Very few people in North America have paid much attention to the Global Government of North America (GGNA). This is no criticism, because the people of Mexico, Canada, Great Britain, Israel, North Pole Region, and of the United States are only now waking up to the true nature of the GGNA despite the best efforts of our political leaders to keep it from them. So, why should you bother? You should start bothering because the GGNA is very good news for you now and a little further down the track. I should start by emphasizing that I speak to you as a good global citizen, with clients and business friends in most countries of the world. We, global citizens, have kept our love for the real GGNA, the GGNA of separate democracies, each with its glorious culture and history. What we fear and dislike intensely are the	Free Trade Agreement (FTA), the North American Free Trade Agreement (NAFTA), and the Free Trade Area of the Americas (FTAA), which are very different things. It is when you put the inverted commas, or quotes, around the word NAFTA that the trouble starts. To justify what I am saying I fear we have to look at the basic history and the raison d'être of NAFTA. How far NAFTA has already got and where it will certainly go if we dont wake up and stop it. The fundamental idea behind NAFTA was born after the FTA, an economic agreement between the U.S. and Canada, but only came to fruition after the United States and Mexico made all sorts of special economic arrangements. This fundamental idea was that nation-states were better off with no other needs than the best economics, and that at the expenses of the values and institutions people from each member state respected most. Those nation-states must therefore be emasculated and diluted into a new form of super-national organization called NAFTA - run, not by elected national politicians reflecting the desires of the peoples, but by a commission of wise technocrats, USA technocrats in most parts running the show. This leads me to the key piece of the NAFTA propaganda: the claim that the USA, Canada and Mexico have kept healthy the economics of the North American continent since its creation, and that it is essential to maintain it in future. This is the big deception, which plays at the almost unconscious level. It is a warm, mystic conviction that NAFTA, with all its faults, must be inevitably good because it brings good economics. But, today, even that is questionable. Those who promote this myth do not tolerate any rational examination of history or the facts. Indeed, they accuse those of us who query the divinity of NAFTA of being rabid nationalists, xenophobes, little Canadians, and worse. You start to be guilty of all this as soon as you dare to point out that the economy alone is not all that matters, and that, what is more important is the protection of the global life-support systems and the primordial human rights which include security. Also important are the cultural and social aspects, as well as our Canadian value systems. Indeed, if you stand back and scratch your head a bit and take a calm look at NAFTA, you will see it is a well-tried model for destruction, not good economics. It contains three of the most important ingredients for conflict. First, it is a top-down amalgamation of different peoples put together without their informed consent, and such arrangements usually end in conflict. Whistle-blowers have been silenced since its creation, and there is no internal auditors. Third, NAFTA is institutionally undemocratic, as I shall show. Let me say here that America alone and unilaterally has invaded Iraq without the consent of Canada and Mexico and, therefore, such an action has endangered the entire North American continent, its economy, the security of its people is at risks, and peace is threatened and replaced by fear. Americans are economically bankrupted and yet they spend astronomical amounts of money with defence because of a threat they created abroad. Now that tells Canadians and the people of Mexico that economics are affected by the U.S. foreign policies, and we should have a say in those policies. Everything is connected: economics, foreign policies, social aspects, the environment, everything. The only valid agreement the U.S., Mexico and Canada should have together is the GGNA. History has one other important lesson for us here, which is that, on the whole, democracies do not provoke war, and indeed it is hard to think of a genuine democracy which has declared war on another. So, we NAFTA-skeptics believe that a free trade association between the democracies of North America, linked through the GGNA, is much less likely to end in tears than is the emerging, undemocratic mega state that is NAFTA (and the FTAA). Let me explain a little of how NAFTA (the FTAA is very much similar) functions and show why it is so innately undemocratic. In other words, what sort of animal are you dealing with? How bad is it now? Even in Canada, very few people realize what huge areas of our national life have already been handed over to control by NAFTA. Put simply, these include: everything to do with a single market -in other words, all of our industry and commerce - all of our social and labor policy, our environment, agriculture, fish, and foreign aid. Even security and the Canadian forces are being handed over to the U.S. technocrates. What do I mean by control from the U.S. technocrates? Well, in all those areas of our national life which used to be entirely controlled by the Canadian Parliament, our government or House of Commons can be outvoted in the NAFTA meetings of member states. That is a system known as "you have no democratic rights, just money to lose". If our government agrees, or is outvoted in any new ruling in those areas, then Parliament, being the House of Commons, must put it into Canadian law. If they dont, the country faces unlimited economic fines. So our Canadian Parliament has already become rubber stamps in all those areas of our national life. Our foreign trade relations are in an even worse category: the commission of the NAFTA bureaucracy self-negotiates those on our behalf. And so in this area, NAFTA already has its own legal personality. So to go back to where we are now, in addition, laws affecting our justice and home affairs and our foreign and defence policies must also be rubber-stamped by the Canadian Parliament if they have not been agreed by our government and all the other member states governments in NAFTA (and similarly in the FTAA). In other words, our government cannot veto new rulings in NAFTA in these areas, and it has to enact them. This all means that NAFTA technocrates actually govern Canada, not the Canadian House of Commons. If Parliament were to reject a new NAFTA ruling in these areas, we would be subject to unlimited fines as we would be in breach of our treaty obligations, which is, of course, a rather more horrifying prospect for our foreign office and political classes in their diplomatic cocktail parties and so on. A fine, after all, is paid by the taxpayer. No rulings in NAFTA has ever been overturned by the Canadian Parliament. NAFTA technocrates act as a higher Court, the highest court in North America - superior to all our national courts including the Supreme Court of Canada - in the area which ceded NAFTA, and it must find in favor of the ever-closer economic union of the peoples of North America, ordained the treaties, and it is guilty of much judicial activism in order to do so. There are four other features of this NAFTA system which are worth emphasizing, all of them innately undemocratic. First, the unelected bureaucracy - the commission has the monopoly to propose all new rulings and change our Canadian laws. This reflects the basic idea behind NAFTA which I have mentioned. The nation-states, the democracies of North America, must be emasculated and diluted into this new super national economic body we called NAFTA and run by the commission of wise technocrats. Second, the commission's legal proposals are then negotiated in secret by the shadowy committee of permanent representatives, or bureaucrats, from the national capital states. The U.S. have already established themselves as being by far the ruling majority technocrates of this body. Decisions are taken in NAFTA, again by secret vote. National parliaments are precluded from knowing how their bureaucrats and ministers negotiate and vote. The commission then executes all NAFTA rulings, supported when necessary by the so-called court. The technocrates pretend that democracy is maintained. But the point remains that the Canadian Parliament itself is excluded from the process. We can and do debate some rulings, but we have to pass them exactly as agreed in NAFTA. A third features of this frightening new system enshrined in the treaties is that once an area of national life has been ceded to control from NAFTA it can never be returned to national parliaments. The fourth feature I would mention is that no changes can be made to the treaties unless they are agreed unanimously by NAFTA technocrates. So the return of powers to national parliament by renegotiation is no realistic. The only way out is the doorway. Canada's membership with NAFTA is also very expensive financially. The government of Canada steadfastly refuses to carry out a cost-benefit analysis because it does not want the result to be made public. So the GGNA has made private studies, which produce a cautious estimate at the cost to the taxpayer and the economy of around six billion per annum, or 2 percent of GDP. Two new studies are on the way which will take this estimate considerably higher. It is also worth saying that the whole of the North American continent will continue in steady and irreversible demographic and therefore economic decline over the next fifty years. Add to this the unemployment and decay caused by globalisation and you have to ask why the Canadian political establishment wants to stay on the Titanic. NAFTA spells out the final extinction of Canadian sovereignty and the sovereignty of the democracy of Mexico. Its worst feature is that it grants its own legal personality superior to that of Canada and Mexico. There is no longer even the pretense that NAFTA is an arrangement between sovereign nations, and that the U.S. technocrates are the majority. Soon we will see a NAFTA flag and an anthem. NAFTA will eventually take over most of the rest of the powers which we have retained in Canada so far, including defence and security. When will Canadians ever held a referendum to reject NAFTA? Canadians have been kept in such ignorance and history shows that we have accepted it all somewhat like frogs in warm water being heated from underneath. We could not react fast enough to reject NAFTA even though it is destroying all of what makes us Canadians. The Canadian Supreme Court should start to take note of NAFTA rulings, and I submit that is not agreeable to our democracy. I feel I must also at least touch on the moral dimension of NAFTA and also of the FTAA. I need hardly say that it is fundamentally secular, irreligious, even atheistic. The convention which was drawing up the agreement refused the supplication of the pope himself, that the agreement should contain at least some reference to our Judeo-Christian heritage. We Canadian-skeptics love the real Canada, but we see NAFTA and the FTAA as a bad idea. It is a bad idea like slavery, communism, high-rise flats. I need to tell the damage which ideas can do when they become generally accepted and turn out to be wrong. I remember the story of the young, white Russian officer who wrote home to his fiancée in 1918 from the front against the Bolsheviks. Oh, my darling, he said. Please do not worry. In a few weeks I shall be home with you in Moscow, and we shall be married. These people are not very well armed, and their ideas are even worse. Well, three days later he was killed, so he was not entirely right about their arms, but he did turn out to be right about the ideas which inspired Soviet Communism. It is just that it took seventy years and fifty million lives to prove him so. Let us hope NAFTA and the FTAA dont end up as quite such a dangerous idea as that. With any luck, it will start to decay from within. If we have the energy to understand it, to expose it, and to fight it. We can do that together. We can make things better. Let us build a democratic GGNA, a true democracy for all Peoples of North America. Concerning sections 1, 2, and 3, it shall be Global Governments highest priority to guarantee these rights to their respective Member Nations and to have proper legislation and implement and enforce global law as it applies and as shown in the Global Constitution. Our investigation has shown that in the past very little importance was ever given to Sections 1,2,3, and 4 of the Scale of Human and Earth Rights. And it is made clear how urgent it is to replace both the Universal Declaration of Human Rights and Charters from all nations by the Scale of Human and Earth Rights. Concerning Sections 4, 5 and 6, it shall be the aim of Global Governments to secure these other rights for all global citizens within their respective Member Nations but without immediate guarantee of universal achievement and enforcement. These rights are defined as Directive Principles, obligating the Global Governments to pursue every reasonable means for universal realization and implementation. a) A common economic zone through the elimination of remaining tariff and nontariff barriers to trade among Member Nations of the GGNA. Member Nations must also expand cooperation on trade-related areas, including border and transportation infrastructure; a concerted effort to reduce the many regulatory gaps and inconsistencies that hamper the flow of trade in Member Nations; and coordinated investment in North America’s human capital, both through education and training, and through improved labor mobility within the continent. b)	An economic space that provides new opportunities for individuals in all Member Nations: adopting a common approach to regulation, increasing labor mobility, and enhancing support for education programs. c) Establishing a Seamless North American Market for Trade. With tariff barriers virtually eliminated, the time has come to take a more comprehensive approach to strengthening the economic prospects for citizens in all Member Nations. The first step is to encourage convergence in the most-favored-nation tariff rates each partner charges on imports from outside the GGNA. Next, the governments should reduce the remaining nontariff barriers to the flow of goods and services, and address problems arising from charges of price discrimination and subsidization by competitors within the GGNA. Finally, they should coordinate their approach to unfair trade practices by foreign suppliers to the North American market. The ultimate goal should be to create a seamless market for suppliers and consumers throughout North America. d) Adopting a common external tariff. We recommend that Member Nations harmonize external tariffs on a sector-by-sector basis, to the lowest prevailing rate consistent with multilateral obligations. The effort should begin with goods on which current tariff rates are closest and then proceed to close larger gaps, with the goal of adopting a common external tariff, thus eliminating the need for rules of origin and further facilitating integration and better use of scarce resources. e) Reviewing those sectors of NAFTA that were excluded or those aspects that have not been fully implemented. Each of the three countries decided to exclude unilaterally certain sectors and issues from NAFTA. Some of these remain sensitive issues; others may be ripe for review. In addition, several elements have not been implemented in the way that all had anticipated. Some changes—for example, the negotiation of a sanitary agreement to promote agricultural trade, or expanding the NAFTA services agreement to include cabotage—would be useful but also difficult. We recommend a high-level review to examine all of these issues and make recommendations on how to make the coverage of NAFTA more comprehensive. f)	Establishing a permanent tribunal for GGNA dispute resolution. The Earth Court of Justice will develop and administer the program. The current NAFTA dispute-resolution process is founded on ad hoc panels that are not capable of building institutional memory or establishing precedent, may be subject to conflicts of interest, and are appointed by authorities who may have an incentive to delay a given proceeding. As demonstrated by the efficiency of the World Trade Organization (WTO) appeal process, a permanent tribunal would likely encourage faster, more consistent, and more predictable resolution of disputes. In addition, there is a need to review the workings of NAFTA’s dispute settlement mechanism to make it more efficient, transparent, and effective. g) Establishing a joint approach to unfair trade practices. The use of countervailing and anti-dumping duties by one Member Nation country against another has generated considerable ill will, though there has been a steady decline in the use of these trade remedies; there have been few new cases in the industrial sectors, with the most difficult cases now limited to resource and agricultural trade. The time has come to adopt a unified approach to deal with the internal and the external challenge of unfair trade practices, beginning with phased suspensions in sectors of laws governing unfair trade practices. h) Establishing a common competition commission. Once Member Nations have concluded the resource accord described above and phased in the suspension of antidumping and countervailing duty proceedings for all sectors, they should also establish a common commission — a continental anti-trust agency — to address harmful subsidy practices, to promote healthy competition, and to protect against predatory pricing. At the same time, they should develop shared standards for identifying and responding collectively to unfair trade practices by parties outsidethe GGNA. i) Adopting a common approach to regulation. Significant regulatory differences continue to divide the North American economic space, and as other barriers to trade, such as tariffs, fall worldwide, regulatory efficiency is becoming increasingly important as a source of competitive advantage. Canada, the United States, and Mexico each have developed rules to protect their environment and the well-being of their citizens. All three share the same broad objectives, but their actual rules have evolved largely in isolation. In many cases, the result is what has been labeled “the tyranny of small differences,” one that imposes large economic costs even when regulatory goals, processes, standards, and outcomes are quite similar. The most obvious costs of unnecessary regulatory differences are borne by businesses and consumers. Rules that fragment the North American market reduce economies of scale and discourage specialization, competition, and innovation. Harmonization of regulation, in effect, creates a bigger market, one that would lead to more competitive exports and lower consumer prices across North America. In addition to raising compliance costs for businesses and their customers, fragmented regulation increases the administrative costs to governments and taxpayers. Regulators in Canada and Mexico each must try to achieve the same results as their counterparts in the United States and yet must do so with only a fraction of the resources. Furthermore, because much of the resulting administrative work is carried out at border points, regulatory differences are particularly damaging in their impact on border delays and congestion, as the volume of trade within North America exceeds the capacity of its border infrastructure. Regulatory differences can have a negative impact on the very environmental and health outcomes the regulations themselves are supposed to encourage. Unnecessary delays in the approval for sale and distribution of innovative products can prevent timely access to new pharmaceuticals or medical technology that might save lives, or to new fertilizers or chemicals that could help industrial plants and farmers do a better job of protecting the environment. A collaborative approach to regulatory reform could help all Member Nations expand economic opportunity within North America while strengthening the protection of the environment, health and safety, and other shared objectives of regulatory policy. While each country must retain its right to impose and maintain unique regulations consonant with its national priorities and income level, the three countries should make a concerted effort to encourage regulatory convergence. j)	Making transportation more efficient. The efficiency of the transportation network is critical to making North America a more competitive place to invest and to produce, and in spreading the benefits of economic growth to all corners of the continent. Among other regulatory reforms, governments should consider the benefits of allowing North American transportation firms unlimited access to each others’ territory, including provision for full cabotage (trade between two points within a country, for example, a Canadian trucker hauling freight from Chicago to Los Angeles or an American airline carrying passengers between Mexico City and Vancouver) for airlines and surface carriers. k)	Adopting the “tested once” approach for biotechnology and pharmaceuticals. The cost and quality of health care is a critical issue in all three countries. Biotechnology and pharmaceuticals play a vital role in providing new treatments that improve health outcomes and often reduce costs as well, but they face huge costs in developing and then winning regulatory approval for new products. Preliminary research suggests that regulatory cooperation in the areas of human and veterinary drugs, medical devices, pest control, and chemicals would raise the value of sales in these sectors by more than 10 percent, profits by 8 percent, and the rate of return on new products by an average of 4.8 percent. Two possible approaches to reducing the regulatory burden while maintaining rigorous standards to protect health and safety would be to adopt a “tested once” principle by which a product tested in one country would meet the standards set by another, or to establish a North America testing center with personnel from each country. l) Integrating protection of food, health, and the environment. The North American market for agricultural and food products is highly integrated, and the intense disruption of this market by just two cases of mad cow disease demonstrates the need to ensure that regulatory processes are as integrated as their relevant markets. Greater North American cooperation also is essential in providing effective responses to threats to human and animal health and to the environment. m) Increasing Labor Mobility among Member Nations. People are GGNA’s greatest asset. Goods and services cross borders easily; ensuring the legal transit of workers has been more difficult. Experience with the NAFTA visa system suggests that its procedures need to be simplified, and such visas should be made available to a wider range of occupations and to additional categories of individuals such as students, professors, bona fide frequent visitors, and retirees. To make the most of the impressive pool of skill and talent within the GGNA, Member Nations should look beyond the NAFTA visa system. The large volume of undocumented migrants from Mexico within the United States is an urgent matter for those two countries to address. A long-term goal should be to create a “North American preference”—new rules that would make it much easier for employees to move and for employers to recruit across national boundaries within the continent. This would enhance North American competitiveness, increase productivity, contribute to Mexico’s development, and address one of the main outstanding issues on the Mexican-U.S. bilateral agenda. Canada and the United States should consider eliminating restrictions on labor mobility altogether and work toward solutions that in the long run could enable the extension of full labor mobility to Mexico as well. n) Expanding temporary migrant worker programs. Canada and the United States should expand programs for temporary labor migration from Mexico. For instance, Canada’s successful model for managing seasonal migration in the agricultural sector should be expanded to other sectors where Canadian producers face a shortage of workers and Mexico may have a surplus of workers with appropriate skills. Canadian and U.S. retirees living in Mexico should be granted working permits in certain fields, for instance as English teachers. o) Implementing the Social Security Totalization Agreement negotiated between the United States and Mexico. This agreement would recognize payroll contributions to each other’s systems, thus preventing double taxation. p) Creating a “GGNA preference.” Member Nations should agree on streamlined immigration and labor mobility rules that enable citizens of all Member Nations to work with far fewer restrictions than immigrants from other countries. This new system should be both broader and simpler than the current system of NAFTA visas. Special immigration status should be given to teachers, faculty, and students in the region. Moving to full labor mobility between Canada and the United States. To make companies based in North America as competitive as possible in the global economy, Canada and the United States should consider eliminating all remaining barriers to the ability of their citizens to live and work in the other country. This free flow of people would offer an important advantage to employers in both countries by giving them rapid access to a larger pool of skilled labor, and would enhance the well-being of individuals in both countries by enabling them to move quickly to where their skills are needed. In the long term, the two countries should work to extend this policy to Mexico as well, though doing so will not be practical until wage differentials between Mexico and its two North American neighbors have diminished considerably. Reinforcing an approach of mutual recognition of professional standards and degrees. Professional associations in each of Member Nations make decisions on the standards to accept professionals from other countries. But despite the fact that NAFTA already encourages the mutual recognition of professional degrees, little has actually been done. Member Nations should devote more resources to leading and create incentives that would encourage, the professional associations of each of the three countries in developing shared standards that would facilitate short-term professional labor mobility within the GGNA. q) Supporting a GGNA Education Program. Given their historical, cultural, geographic, political, and economic ties, Member Nations should have the largest and most vibrant educational exchange network in the world. Currently, we do not. Despite the fact that Mexico is the second-largest trading partner of the United States, it ranks only seventh in sending students there. In 2004, only 13,000 Mexican undergraduate and graduate students attended U.S. universities. Similarly, Canada is the largest trading partner of the United States but ranked only fifth in educational exchanges, with 27,000 students in the United States compared to 80,000 students from India, followed by China, South Korea, and Japan. The number of Mexicans studying in Canada remains very low—about 1,000. And although American students study all over the world, relatively few go to Mexico and Canada. These numbers should be expanded dramatically to deepen familiarity and increase knowledge in each Member Nation. r) Creating a major scholarship fund for undergraduate and graduate students to study in Member Nations and to learn the region’s languages. For many students, study abroad is possible only with financial assistance, but many scholarships, including the Fund for the Improvement of Post-Secondary Education (FIPSE), which has supported scholarships to and from all North American countries, have been reduced or halted. Cross-border educational study within the GGNA by its citizens should expand to reflect the degree of our commercial exchanges. To illustrate the scale of this proposal, it would lead to some 60,000 Mexican students studying in the United States and Canada, and comparable numbers of Canadian and American students studying in another Member Nation. We urge that state, provincial, and federal governments begin funding such scholarships now. The scholarships should include “language immersion” courses in each Member Nation and should encourage students to study in all Member Nations. Developing a network of centers for GGNA studies. The European Union provides substantial funding for EU centers in fifteen universities in the United States, as well as twelve Jean Monnet Chairs. The U.S. Department of Education provides similar grants to support language and international studies outside North America, but not within North America. That should change. We recommend that the governments open a competition and provide grants to universities in each Member Nation to promote courses, education, and research on the GGNA and assist elementary and secondary schools in teaching about the GGNA. They could also administer scholarship programs. To support this effort, a student summit should be held periodically in each of the three countries. Promoting Internet-based learning within the GGNA. A natural way to channel communication between Canada, the United States, and Mexico would be through Internet-based learning tools. Current examples include the Historica Foundation’s YouthLinks program in Canada, which enables high-school students to connect with their counterparts in other regions of Canada and around the world, and the School Connectivity Program (SCP) launched by the U.S. Department of State, which installs computers with Internet access in schools across nations that lack access to computer technology. The SCP program should be extended to all Member Nations. Developing teacher exchange and training programs for elementary and secondary school teachers. This would assist in removing language barriers and give some students a greater sense of the GGNA identity. Greater efforts should also be made to recruit Mexican language teachers to teach Spanish in the United States and Canada. Developing “sister school” and student exchange programs. Studying or living in another country or hosting a foreign-exchange student fosters cultural understanding. We recommend that states and municipalities encourage the development of “sister school” programs at both the secondary and university level to include the annual exchange of students between participating schools. Encouraging imaginative ways to build GGNA connections between Member Nations. Foundations and research institutes can shape the way public and private institutions engage in a new concept such as the GGNA community. We encourage foundations and research institutes to provide support and research for addressing continental issues and developing curricula that would permit citizens of our three countries to look at each other in different ways than in the past. • Member Nations should approach continental issues together with a GGNA perspective rather than the traditional “dual-bilateral” approach that has long characterized their relationships. • North America is different from other regions of the world and must find its own cooperative route forward. A new GGNA community should rely not only on the market, but also on building a true GGNA Community. We must maintain respect for each other’s national sovereignty by forming the GGNA protecting such sovereignty and developing the Global Constitution. • Our economic focus should be on the creation of a common economic space that expands economic opportunities for all people in the region, a space in which trade, capital, and people flow freely. • The strategy needs to be integrated in its approach, recognizing the extent to which progress on each individual component enhances achievement of the others. Progress on security, for example, will allow a more open border for the movement of goods and people; progress on regulatory matters will reduce the need for active customs administration and release resources to boost security. GGNA solutions could ultimately serve as the basis for initiatives involving other like-minded countries, either in our hemisphere or more broadly. • A GGNA strategy must provide real gains for all Member Nations, and must not be approached as a zero-sum exercise. Poverty and deprivation are breeding grounds for political instability and undermine both national and regional security. The progress of the poorest among us will be one measure of success. The threat of international terrorism originates for the most part outside North America and is due primarily on the American Government foreign policies. All Member Nations of the GGNA should have a veto on such policies. All foreign policies should be dealt by the GGNA and not by a single individual Member Nation. Security should be handle by the GGNA. Any weakness in controlling access to Member Nations from abroad reduces the security of the GGNA as a whole and exacerbates the pressure to intensify controls on intracontinental movement and traffic, which increases the transaction costs associated with trade and travel within Member Nations. September 11 highlighted the need for new approaches to border management. In December 2001, Canada and the United States signed the Smart Border Declaration and an associated 30-point Action Plan to secure border infrastructure, facilitate the secure movement of people and goods, and share information. A similar accord, the United States-Mexico Border Partnership Agreement, and its 22-point Action Plan, were signed in March 2002. Both agreements included measures to facilitate faster border crossings for pre-approved travelers, develop and promote systems to identify dangerous people and goods, relieve congestion at borders, and revitalize cross-border cooperation mechanisms and information sharing. We should expand such programs to all Member Nations. The defence of GGNA must consist of a more intense level of cooperation among security personnel of Member Nations, both within the GGNA and beyond the physical boundaries of the continent. The Container Security Initiative, for example, launched by the United States in the wake of 9/11, involves the use of intelligence, analysis, and inspection of containers not at the border but at a growing number of overseas ports from which goods are shipped. The ultimate goal is to provide screening of all containers destined for any port in North America, so that once unloaded from ships, containers may cross land borders within the region without the need for further inspections. • Establishing a common security perimeter by 2024. Member Nations should articulate as their long-term goal a common security perimeter for the GGNA. In particular, Member Nations should strive toward a situation in which a terrorist trying to penetrate our borders will have an equally hard time doing so, no matter which country he elects to enter first. We believe that these measures should be extended to include a commitment to common approaches toward international negotiations on the global movement of people, cargo, and vessels. Like free trade a decade ago, a common security perimeter for the GGNA is an ambitious but achievable goal that will require specific policy, statutory, and procedural changes in all three nations. • Developing a GGNA Border Pass. Member Nations should develop a secure GGNA Border Pass with biometric identifiers. This document would allow its bearers expedited passage through customs, immigration, and airport security throughout the region. The program would be modeled on the U.S.-Canadian “NEXUS” and the U.S.-Mexican “SENTRI” programs, which provide “smart cards” to allow swifter passage to those who pose no risk. Only those who voluntarily seek, receive, and pay the costs for a security clearance would obtain a Border Pass. The pass would be accepted at all border points within the GGNA as a complement to, but not a replacement for, national identity documents or passports. Jointly inspect container traffic entering Member Nations ports, building on the Container Security Initiative. • Expanding the GGNA border infrastructure. While trade has nearly tripled across both borders since the Canada-U.S. Free Trade Agreement (FTA) and NAFTA were implemented, border customs facilities and crossing infrastructure have not kept pace with this increased demand. Even if 9/11 had not occurred, trade would be choked at the border. There have been significant new investments to speed processing along both the Canadian-U.S. and Mexican-U.S. borders, but not enough to keep up with burgeoning demand and additional security requirements. The three governments should examine the options for additional border facilities and expedite their construction. In addition to allowing for continued growth in the volume of transborder traffic, such investments must incorporate the latest technology, and include facilities and procedures that move as much processing as possible away from the border. Security cooperation among Member Nations should also extend to cooperation on counterterrorism and law enforcement, which would include the establishment of a trinational threat intelligence center, the development of ballistics and explosives registration, and joint training for law enforcement officials. • Increasing information and intelligence-sharing at the local, national, and global levels in both law enforcement. Law enforcement cooperation should be expanded from its current levels through the exchange of liaison teams and better use of automated systems for tracking, storing, and disseminating timely intelligence. This should be done immediately. However, the ultimate goal needs to be the timely sharing of accurate information and intelligence and higher levels of cooperation. Member Nations should consider a more extensive information-sharing and collaborative planning involving law enforcement as a means to build mutual trust and pave the way for closer cooperation in the future. Training and exercises should be developed to increase the cooperation and interoperability among and between the law enforcement agencies. These steps will provide better capabilities for detection of threats, preventative action, crisis response, and consequence management. At least one major exercise conducted by law enforcement authorities should be established as a goal over the next year. Of course, the extent of cooperation will be affected by the progress of reform of the police forces, customs, and judicial branch in Member Nations. In addition to the sharing of information, a Joint Analysis Center should be established immediately to serve as a clearing house for information and development of products for supporting law enforcement. • Intensifying Mexican efforts to accelerate its economic development. NAFTA has transformed Mexico, but it has also deepened and made much more visible the divisions that exist in the country. Indeed, the northern part of Mexico, where the population has a higher level of education and is better connected to American and Canadian markets, has grown significantly faster than the center and the south. NAFTA was designed to create new opportunities for trade and investment in Mexico and thus complement Mexican development programs. Officials hoped that Mexico would grow much faster than its more industrialized partners and begin to narrow the income gap among the three countries. However, investment has been modest, preventing Mexico from achieving higher levels of growth. Indeed, the Organization for Economic Cooperation and Development (OECD) estimated that, with significant levels of investment, Mexico’s potential growth rate could reach 6 percent. But that requires big changes in current policies. For example, the World Bank estimated in 2000 that $20 billion per year for a decade is needed for essential infrastructure and educational projects in Mexico. The gap in wages has led many Mexicans to travel north in search of higher incomes and better opportunities. For the past three decades, Mexico has been the largest source of legal immigrants to the United States, and Mexican-Americans make increasingly valued and growing contributions to the life of the United States and, through remittances, to their families at home. Mexico is also the leading source of unauthorized migration, with attendant economic and security problems in both countries and untold hardships for Mexican migrants. Over time, the best way to diminish these problems is by promoting better economic opportunities in Mexico. Mexico also requires significant reforms in its tax and energy policies so that it can use its own resources more effectively to advance its economic development. (7) establishing clear and measurable objectives for public spending. Of course, it will be up to Mexicans to develop the policy conditions for these changes to take place. All Member Nations need to acknowledge that a major regional effort is also necessary. To that end, Canada and the United States should build on their bilateral initiatives supporting Mexico’s development, notably the U.S.-Mexico Partnership for Prosperity and the Canada-Mexico Partnership. In both programs, the private sector in all three countries is a partner in the development effort. Mexico should also be recognized as a priority within the international development programs of both the United States and Canada, and both should explore with the World Bank and the Inter-American Development Bank ways to use multilateral development funds most effectively to address the North American development challenge. Canada recently announced a major reform of its development assistance programs, doubling overall resources while focusing its efforts on a core group of countries. Mexico is not included in that new list and it should be. • Establishing a Global Government of North America Investment Fund (GGNAIF) for infrastructure and human capital. With a more conducive investment climate in Mexico, private funds will be more accessible for infrastructure and development projects. The United States and Canada should establish a GGNAIF to encourage private capital flow into Mexico. The fund would focus on increasing and improving physical infrastructure linking the less developed parts of Mexico to markets in the north, improving primary and secondary education, and technical training in states and municipalities committed to transparency and institutional development. A relatively small amount of funds should be targeted for technical assistance for project design and evaluation, management, and training. If the GGNAIF is to be effective, it will need significant help from the United States and Canada, and counterpart funding through higher tax revenues from Mexico. The fund design should consider such issues as incentives and debt absorption and management capacity of subnational governments to ensure that resources are effectively used. The fund will need to be managed in a transparent manner according to best international practices, and should be capitalized through a diverse set of innovative financial mechanisms. Availability of credit enhancement mechanisms for long-term loans in pesos will be critical. (4) strengthen its technical assistance programs to promote good governance and creditworthiness of communities and public utilities. GGNADBank’s internal procedures and the process of project certification should be reformed in order to allow for a significantly faster and more transparent deployment of funds. All Member Nations produce substantial amounts of energy, but the region as a whole is a net importer of energy. Washington’s two neighbors are its biggest suppliers of energy. The production of oil and natural gas on the continent is not keeping up with the growth in demand. Although North American production of oil and gas has been declining, both Canada and Mexico have the potential to develop growing supplies both for their own direct use and for export. These two countries, however, have distinct approaches to the development of energy and other natural resources that must be taken into account in the process of mapping the best path forward for North America. Canada is committed to efficient energy markets, open investment, and free trade in this sector. Canada’s vast oilsands, once a high-cost experimental means of extracting oil, now provide a viable new source of energy that is attracting a steady stream of multibillion dollar investments, and interest from countries such as China, and they have catapulted Canada into second place in the world in terms of proved oil reserves. Production from oilsands fields is projected to reach 2 million barrels per day by 2010. The most serious constraints on additional growth are the limited supply of skilled people and the shortage of infrastructure, including housing, transportation links, and pipeline capacity. Another constraint is regulatory approval processes that can slow down both resource and infrastructure development significantly. Mexico is also a major energy supplier and customer within North America. In 2004, it was the second-largest exporter of oil to the United States; in previous years, it was consistently among the top four suppliers. Mexico relies for a significant share of its revenues on the state oil producer (Pemex). It has major oil and gas reserves, but these are relatively untapped. Development has been hampered by constitutional restrictions on ownership, which are driven by an understandable desire to see this strategic asset used for the benefit of Mexicans. This restriction on investment, coupled with the inefficient management of the state monopoly, Pemex, has contributed to low productivity. As a result, Mexico has expensive and unreliable supplies of energy for its consumers and industries. Mexico has begun to bring in some foreign capital through multiple service contracts, but the most serious constraints on its future growth as an energy supplier are the restrictions that impede development of its own energy resources and the low productivity of Pemex. Reforms in this area are needed urgently. Although energy security represents perhaps the most critical challenge, it is important to recognize that trade in other natural resources, including metals, minerals, wood, and other products, is also central to the growth and economic security of North America. In these other resource sectors, NAFTA has not succeeded in ensuring a free flow of goods. Resource and agricultural products such as softwood lumber, fish, beef, wheat, and sugar have been the flashpoints for highly visible trade disputes. The softwood lumber case has led some Canadians to question whether the United States will comply with NAFTA if decisions by the dispute-settlement mechanism run counter to private American interests. The United States and Mexico have failed to comply with free trade provisions on movement of trucks for more than a decade, and the failure to resolve the softwood lumber case between Canada and the United States has plagued their trade relations for the past quarter century. Changing some trade rules and the dispute settlement process may reduce this friction, as would a determined effort to reduce unnecessary regulatory differences within North America. The GGNA is blessed with an abundant resource base. Exploiting these resources on a long-term, sustainable basis requires that Member Nations work together to resolve issues and ensure responsible use of scarce resources and the free flow of both resources and capital across all borders. As noted, the most troubled areas of cross-border trade over the past twenty years have been in resource trade, largely because of the impact of regulatory differences, including different approaches to resource pricing and income protection. Efforts to eliminate these problems on the basis of dispute settlement mechanisms have not worked as well as anticipated. • Developing a GGNA energy strategy. Recognizing their individual policies and priorities, Member Nationss need to work together to ensure energy security for people in all Member Nations. Issues to be addressed include the expansion and protection of the North American energy infrastructure; development opportunities and regulatory barriers; and the technological and human capital constraints on accelerated development of energy resources within the GGNA. These objectives form part of the agenda of the North American Energy Working Group established in 2001. This initiative, however, has so far made only modest progress toward developing a GGNA strategy, and it does not cover oil. • Fully developing Mexican energy resources. Although the inclination of Mexico to retain full ownership of its strategic resources is understandable, expanded and more efficient development of these resources is needed to accelerate Mexico’s economic growth. Mexico is quickly losing ground in its energy independence, and the only way to satisfy growing demands within Mexico is to find ways to unlock its energy sector. Progress can be made even under the existing constitutional constraints. As discussed above, Canada and the United States could make important contributions in this effort through the development of creative mechanisms, especially financial, that bring needed technology and capital to Mexico. The most important steps, however, must be taken in Mexico by Mexicans. • Concluding a GGNA resource accord. In order to ensure the fullest development of North America’s mineral, forest, and agricultural resources, investors in one country need to be confident that they will not be harassed by competitors in another. To that end, Member Nations need to conclude an accord that recognizes the balance between security of supply and security of access and includes rules about resource pricing that will reduce the friction that has given rise to some of the most persistent and difficult bilateral irritants. A resource accord should also address the remaining barriers to trade in agricultural products, including barriers that arise from the different regimes in the three countries, to guarantee prices and incomes. • Making a GGNA commitment to a cleaner environment. Expanding energy production as a driver of a more competitive and growing North American economy brings with it a joint responsibility for shaping a cleaner environment and reducing pollution. For example, Canada has signed the Kyoto Protocol on global climate change, which requires significant reductions in emissions of greenhouse gases, but that agreement does not cover Mexico, and Washington has opted out. A North American energy and emissions regime could offer a regional alternative to Kyoto that includes all three countries. Such a regime should include a tradable voucher system for emissions trading within the region analogous to the Clean Development Mechanism. • Expanding a GGNA collaboration on conservation and innovation. The development of new technologies and conservation strategies is essential both to reduce pollution and to make the most of North America’s resource strengths. Currently, the North American Energy Working Group addresses only a limited number of energy-related opportunities for collaboration. Future initiatives should focus on development of desalination technologies, alternative energy sources, cleaner burning fuels, and more fuel-efficient passenger vehicles. Effective progress will require new institutional structures and arrangements to drive the agenda and manage the deeper relationships that result. Canada, the United States, and Mexico already share a rich network of institutional links. A recent Canadian government study identified 343 formal treaties and thousands of informal arrangements or “light institutions” with the United States alone. Mexico has more than 200 formal treaties and agreements with the United States. There are many fewer arrangements between Canada and Mexico, but the network of contacts is still substantial and growing. • An annual Global Government of North America Summit meeting. There is no more succinct or forceful way to demonstrate to the people of all Member Nations the importance of the GGNA than to have the leaders meet at least once a year. • Strengthening government structures. To ensure that the summit meetings achieve their full potential, each government must take steps to reinforce the ability of its internal structures to deal effectively and imaginatively with North American issues. Steps should include strengthening links between governments by establishing minister-led working groups that will be required to report back within ninety days, and to meet regularly. • A Global Government of North America Advisory Council. To ensure a regular injection of creative energy into the various efforts related to the GGNA, Member Nations should appoint an independent body of advisers. This body should be composed of eminent persons from outside government, appointed to staggered multiyear terms to ensure their independence. Their mandate would be to engage in creative exploration of new ideas from a GGNA perspective and to provide a public voice for Member Nations. A complementary approach would be to establish private bodies that would meet regularly or annually to buttress Member Nations relationships. The Global Government of North America must work for the average citizen. When adequate public policies are in place to foster economic and social cohesion, increased trade and investment flows will only improve the living standard of the majority of the population. Economic and social cohesion in Member Nations is in the interest of the GGNA, because it will result in an expansion of the domestic market and it will reduce the flows of undocumented northward migration, thus enhancing security in Member Nations. Reforms to reduce poverty and inequality in Mexico must start from within. Mexico must focus on achieving universal primary education; promoting gender equality and empowering women; building integrated infrastructure networks, water, and sanitation facilities; applying science, technology, and innovation for development; and promoting environmental sustainability. As many Mexicans have claimed, building up the tax revenue base, along with beefing up the country’s antitrust agency and its regulatory capacity, are essential to increase competitiveness. The government needs to build the infrastructure—human, physical, and institutional—for ordinary people to take advantage of the GGNA. Economic and social citizenship in the GGNA implies the ability of citizens to exert pressure for the implementation of an inclusive economic policy at home and to be engaged in the international economy. To the extent that citizens of Member Nations see that the GGNA brings concrete benefits, a new constituency will be galvanized to support these efforts in the years to come. * And creating a single, integrated program to allow “trusted travelers” who frequent the borders to travel quickly by air, land and sea. NAFTA has dramatically enhanced our ability to make better use of the abundant resources of our three countries, and thus made an important contribution to economic growth within the GGNA. Over the last decade, however, our economies have faced growing challenges in increasingly competitive and globalized world markets. We need to do more to ensure that our policies provide our firms and workers with a fair and unfettered basis to meet the challenges of global competition. Unwieldy North American rules of origin, increasing congestion at our ports of entry, and regulatory differences among our three countries raise costs instead of reducing them. Trade in certain sectors—such as natural resources, agriculture, and energy—remains far from free, and disputes in these areas have been a source of disagreement among our countries. Furthermore, the NAFTA partners have been unable to resolve a number of important trade and investment disputes, which has created continuing tension in our commercial relationships. Changes in formal trade agreements will not de done. However, in other areas, notably regulatory cooperation and the expansion of transborder activities in critical sectors such as transportation and financial services, there is a shared recognition that Member Nations can and should act quickly in ways that would make a real difference in improving the competitiveness of firms and individuals in the GGNA. Shared challenge of uneven economic development. A fast lane to development is crucial for Mexico to contribute to the security of the entire region. Mexico’s development has failed to prevent deep disparities between different regions of the country, and particularly between remote regions and those better connected to international markets. Northern states have grown ten times faster than those in the center and south of the country. Lack of economic opportunity encourages unauthorized migration, and has been found to be associated with corruption, drug trafficking, violence, and human suffering. Improvements in human capital and physical infrastructure in Mexico, particularly in the center and south of the country, would knit these regions more firmly into the GGNA economy and are in the economic and security interest of all Member Nations. Politics and Justice without borders: Canada and the U.S.
CANADA TODAY is under threat. The country's capacity and even existence as an independent nation, able to shape its own political, social and economic future, are at risk. Relations between Canada and the United States (US) are decidedly chilly these days: the Iraq war, trade disputes, name-calling, and bickering at the border. It doesn't mean that the relationship will grind to a halt. With more than half a million people and a billion dollars worth of trade crossing the border daily that is not going to happen. Every day thousands of cars, trucks, trains and planes roll across the Canada-U.S. border as more than $1 billion in trade circulates between the countries. Year in and year out, Canada and the United States are each other’s biggest trading partners. The longtime relationship is worth hundreds of billions annually. Canada’s exports to the U.S. accounted for $348.4 billion – about 84 per cent – of the $410.7 billion in goods shipped out of the country last year. Conversely, about 71 per cent of Canada’s $356 billion in imports last year arrived from the U.S. Together the United States, Canada and Mexico have a trading relationship worth more than $700 billion a year; an increase of 88 percent between 1993 and 2003. Economic retaliation is unlikely because the North American Free Trade Agreement (NAFTA) has changed the trading relationship between the two countries. Many plants in Canada now have North American product mandates and are producing for the entire Canada-U.S. market, while those in the U.S. operate in the same fashion. That means a huge amount of cross-border trade is now intra-company trade. That creates a strong incentive for business to lobby both governments to avoid economic disruptions or retaliation no matter what the nature of the relationship at the top. The U.S. has a vital interest in keeping the border open. Its economy would be hurt, whether in the integrated auto and other manufacturing sectors, or in petroleum and other vital resource sectors. Thus, both countries would be highly motivated to minimize disruptions and normalize cross-border traffic quickly should another terrorist attack occur. The most important priority for Canadian diplomacy over the next few years is to reach a new accommodation with the United States because it is only when that relationship is comprehensible, predictable and sound that the country can again assume a meaningful world role. There is a wide gap in attitudes between the business élite and the Canadian public. Business leaders are closer to U.S. policymakers in their attitudes on a range of issues, from the war in Iraq to missile defense to Kyoto. Unlike the general public, they favour minimalist government and low taxes. They believe we must fall into line with U.S. policies at all costs or risk our economic security. Many would like Canada to become more like the U.S. Although small in number, this group has great capacity, as the record shows, to shape the public debate and influence policmakers. Allowing corporate North America to define our interests as a nation implies, in the end, complete regulatory harmonization with the U.S. and the subordination of our economic, social, cultural, environmental and defence policies to U.S. policies. Business elites and many of our own politicians argue that Canada can and should enter into a relationship with the U.S. which is similar to the relationship between the countries of the European Union (EU). However, it is a mistake to think that harmonization or integration with the U.S. will cause the U.S. to adopt Canadian or Canada-friendly policies. While the EU countries enjoy a relatively balanced relationship, Canada and the U.S. are far from equal partners. The economic and military superpower status of the U.S. makes such balance impossible. Thus, although it is rarely acknowledged by our economic and political elites, the practical implications of closer ties to the U.S. are that Canada will be forced to adopt U.S. policies through immense economic pressure. Everything from health care to immigration to security to control of resources would be affected. How would Canada maintain any sort of distinct identity or sovereignty in such conditions? The simple answer is that it wouldn't. Canada would become an American colony in all but name; it would not become the 51st state, because that would mean political integration on a par with the level of economic integration, which is not a factor in any proposals for deep integration (FTA, NAFTA, etc.). This is an even more pressing issue at a moment in history when the U.S. is governed by an administration that is repealing civil rights and liberties, pulling money from social programs, disputing the scientific evidence for climate change and increasing pollution, and most disturbing of all, withdrawing from agreements and treaties which have allowed the world to develop an international rule of law. While Canada remains committed to multilateralism, the U.S. has refused to participate in a long list of important international conventions and treaties, including the Kyoto Protocol, the Rome Statute of the International Criminial Court, the land mines and nuclear test ban treaties, and many others. Nor has the U.S. respected the U.N. in launching its war against Iraq, a predatory invasion of the Iraqui people for their oil & gas resources. Meanwhile, every public opinion poll continues to demonstrate that the overwhelming majority of Canadians don't want to be just like the U.S. Canadians may respect the U.S. ideals of freedom and democracy, enjoy some U.S. movies, T.V., music and authors, and remain committed to the close neighbourly relationship between the people of the two countries, but that doesn't mean that Canadians want to adopt every aspect of U.S. policy or sacrifice our ability to make unique democratic decisions of our own. Most of us still believe that there are important differences between the U.S. and Canada, and that these differences should be preserved. Many Canadians disagree strongly with the policies of the current U.S. administration, and object to implementing similar policies here at home. Unfortunately, our voices are rarely being heard when compared with the abundant propaganda of the "continentalists", and those advocating "deep integration". "Continentalists" and "deep integration" proponents rarely miss an opportunity to warn that another terrorist attack is inevitable and that an extended border disruption (or series of border disruptions) would be devastating for the Canadian economy unless we protect ourselves by entering into agreements with the US. What is needed, they say, is a comprehensive negotiation where trade-offs across sectors are possible. "Deep integration" is an economic term. It refers to economic integration that goes well beyond removal of formal barriers to trade and includes various ways of reducing the international burden of differing national regulations, such as mutual recognition and harmonization. "Deep integration" means, in reality, subjugating many of Canada's policies to those of the United States — including trade, immigration, energy, water, our dollar, taxation, defence and the environment — but without any corresponding voice in the governance structure — that is, the U.S. government — where decisions affecting many aspects of Canadian life would be made. a)	giving the US whatever access to our energy that they want, even if that means dropping our pledge to deal with climate change through the Kyoto agreement. d) give up policies on culture and agriculture, including the Canadian Wheat Board; and so on. Canadians would not only become almost powerless in addressing their fundamental future economic concerns, but would also lose the capacity to control the social environment and the ability to adjust to change because social policy would also end up being driven by U.S. policies. What kind of Canada do proponents envisage at the end of the proposed deep integration path? And what guarantees would we have that, no matter what economic or security integration agreements are in place, the Americans wouldn’t still close or disrupt the border? The FTA dispute mechanism was supposed to protect us from U.S. actions against softwood lumber, cattle, and other exports, but has disastrously failed to do so. Here, then, is the real story behind “deep integration”. Canada’s business class simply cannot compete with its U.S. counterpart. They refuse to pay for the necessary research and development, refuse to train their workers, are constantly begging for more tax cuts, and are notoriously risk-averse. As well, Canadian companies are eager to simply sell out to U.S. corporations. Since 1989, more than 95 percent of foreign investment in Canada has gone to buying up Canadian companies. Head offices are pouring over the border. The sheer lack of entrepreneurial vision is evident in Bay Street’s determination to tie itself to what more and more economists are declaring a declining economic power. The growing consensus is that smart countries and companies are getting in on the game where the growth is: China, India, Brazil, Russia, and South Africa. But not Canadian companies. One of the reasons: the US is now beginning to lose its technology-based competitive advantage. The countries of western Europe, Japan, Korea, and even China have set ambitious national goals and are building universities, inviting immigration, and have clear objectives regarding industrial development and new technologies. The United States is the economy and country to which Canada’s business leaders want us to tie our star. But even worse, the Government of Canada and Canada's business class actually believes they can negotiate a good deal with the current U.S. administration and Congress. This is delusional, given the rapid devolution of the U.S. into an imperial theocracy. It’s time for Canadians to look elsewhere for leadership; our economy, not to mention our country, is far too important to leave to the failed imagination of Bay Street CEOs. Under their interpretation of co-operation, Canada, the U.S. and Mexico would insulate themselves against competition from the rest of the world with a common external tariff, and with an outer security perimeter against external threats. But as fast as they would construct these walls on the outside, they would tear down almost every fence on the inside with an across-the-board harmonization of rules, regulations and laws on everything from who could seek asylum in North America to military operations to pollution and environmental controls. In fact, they would go so far as to give Canadians and Americans absolute freedom to decide where they would work and where they would live. The Europeans have built an economic and social partnership to address shared problems by creating shared political and administrative institutions. But it would be naïve to believe that similar institutions could be effectively created and made to work genuinely in a Canada-U.S. or a Canada-U.S.-Mexico partnership. The United States, as an imperial superpower, acts on the basis of economic and military power, not shared decision-making, and, given the country's great size, would not consider serious sharing of decisions and power with a much smaller country. The United States is instinctively unilateral in its approach. If Canada is to pursue "deep integration" with the United States, then logically we should seek political union as well so that Canadians in the different provinces would have some opportunity to influence decisions. But this logical implementation of "deep integration" would also mean the end of Canada as a distinct geopolitical entity and the conversion of our provinces into U.S. states. Despite accelerated economic integration over the last 15 years, opinion polling reveals a deep and growing divide in attitudes and values between Canadians and Americans. It shows that the vast majority of Canadians do not want to be more like Americans. On the contrary. Nevertheless, a majority of Canadians have come to terms in principle with NAFTA, and a substantial minority favour even closer economic integration. However, most Canadians don’t understand the term economic integration, and support drops sharply the more NAFTA and deep integration initiatives are perceived to impair domestic policy freedom. For the vast majority of Canadians, continued support is contingent on maintaining policy independence and retaining Canada’s unique social character. The confusion around the issue of integration and independence is understandable. The linkages are often subtle and indirect, and it takes time for effects to become apparent. And the mainstream media gatekeepers and pundits have steered away from this issue. "Continentalists" promote a "strategic bargain," in which Canada and the United States, over time, would move to a customs union with a common made-in-Washington trade policy toward the rest of the world and the free movement not only of goods and services but also of people and capital. (So much for maintaining Canadian ownership of banks, TV networks or transportation systems.) This would also affect foreign policy: If the United States decided to use trade measures to punish China, attack the Europeans or demonize the Cubans, we would have to follow suit. Deep integration advocates see a customs union as the next stage in the deepening of the continental market. Key features associated with a customs union are the creation of a common external tariff applied to all nations not part of the free trade area, and the establishment of a common trade policy. However, many advocates of a customs union also insert elements of a common market into their definition. A common or single market is seen in the literature as a still deeper stage of economic integration. It would include removing barriers to trade and investment in agricultural, cultural, legal, communications, and financial services. It would include the harmonization of a vast range of regulations and policies (economic, social, environmental, cultural, immigration, etc.) to achieve the free movement of goods, services, capital and labour. This is an important point. The lesson to recall from the FTA is that what was initially presented as a proposal for a conventionally defined free trade agreement resulted in a comprehensive deep economic integration agreement that went far beyond the border into the very heart of domestic policy-making power. An alleged customs union negotiation would be similarly open-ended, making it hard in advance to fully evaluate its costs. We also know from the FTA experience that much will be surrendered for little gain. The standard economic case for a customs union is that removing rules of origin (which currently prevent back-door entry of imports from a non-member country into the NAFTA area through a member that has lower tariffs on the those imports) will eliminate costly administrative procedures and thereby reduce transaction costs of doing business. Proponents have built economic models that greatly exaggerate the overall efficiency gains to the economy (2-3% of GDP). Many of us remember the wildly exaggerated estimates of economic benefits of tariff elimination generated by similar models during the FTA debate. Nor do they mention possible costs of removing rules of origin as an incentive to source production within Canada. But the focus on rules of origin is a diversion The far greater cost is that a common trade policy—given the huge difference in power—would mean effectively handing over Canada’s trade policy to U.S. authorities. It would have huge implications for both our domestic institutions and our relations with the rest of the world. Contrary to proponents’ claims that Canada’s positions and protections in multilateral trade agreements, such as the World Trade Organization (WTO), are very similar to those of the U.S., there are in fact major differences between them, affecting crucial public policy areas. They include public services such as health, education, and other social services which, unlike in the U.S., are not organized on market principles; they include cultural industries, which are subsidized and regulated in direct opposition to free trade principles. Also on the table would be agricultural marketing boards, the Canadian Wheat Board, telecommunications, and banking. The U.S. has long objected to these policies and would definitely target them for elimination. In heavily protected U.S. sectors such as sugar, textiles, beef and tropical fruits, Canada would ironically be pushed to raise its tariffs to U.S. levels. It would mean complying with U.S. trade embargoes on Iran and Cuba and ending Canadian trade preferences with, for example, Commonwealth countries. And it would foreclose future independent policy initiatives. Imagine, for example, under a common trade policy persuading American drug companies and policy-makers to allow the export of cheap generic AIDS drugs to poor countries. If, like the FTA, a negotiation were to go beyond the traditional scope of a customs union, the potential for ceding regulatory and policy space would grow exponentially. A major Canadian objective would obviously be exemption from U.S. trade protection laws. But the U.S. Congress would insist that this be off-limits and would (as it does now) say that, if Canada wants exclusion from U.S. trade laws, it has merely to adopt U.S.-style laws and practices. Since the signing of the Free Trade Agreement, Canada's economic life has become deeply integrated into a newly developed North American economy dominated and directed by U.S. corporate and government interests. The results of this integration are now clear. As critics predicted, the free flow of capital without government regulation has resulted in job losses - 276,000 high-paying industrial jobs have been lost - and we are now even more dependent on the American economy as a destination of our exports, and therefore less able to direct our own economy. Economic growth in the 10-plus years of free trade has been the worst since the 1930s. Following the deregulation imperative of free trade, we have both abandoned the tools of industrial development that brought us the auto industry and deliberately pursued policies that weaken the domestic economy in the interests of trade. By pursuing trade with a low Canadian dollar we have exposed Canadian industry to the most extensive and prolonged sell-off of Canadian assets in our history. The results of this for ordinary working Canadians have been the longest period of stagnation in standard of living levels in the country's history, a dramatic erosion of social programs and protection for workers, extreme levels of economic insecurity for millions of workers and their families, and a loss of democratic control by citizens over the future of their communities. All of these economic facts can be traced primarily to the FTA and the North American Free Trade Agreement (NAFTA). The nature of those binding and legal agreements prevents from reconsidering our options. After a decade of rapid integration with the United States and the harmonization of public policy with that country, Canada is experiencing the fastest and most dramatic increases in social and economic inequality in its history. The severe erosion of programs such as UI/EI, social assistance and income redistribution, and the erosion of our progressive tax system, have systematically changed the relationship between individual citizens and their community - because government is a reflection of community. As citizens perceive government as less and less relevant to them, we feel less and less commitment to the collective that is neighbourhood, community and country. Economic integration with the United States is changing our very definition and conception of culture and therefore our sense of who we are. In the United States, culture is seen as a commodity no different from any other commodity - it is equated with entertainment in the marketplace. Canada's efforts to promote our unique identity and reflect it to ourselves confront increased burdens as the United States watches over any "unfair subsidies" to our so-called "cultural industries." As we become integrated with the most powerful example of consumer society in the world, we face the threat of commodification of our cultural traditions and their gradual assimilation into the American entertainment industry. When Canada signed the FTA and NAFTA it agreed to do what literally no other country in the world has ever agreed to. It agreed to give up, forever (barring the abrogation of the trade agreements themselves), the legislative and regulatory authority to protect and conserve the country's energy resources for its own needs. In effect, we have completely abandoned that part of our national sovereignty that allowed us to determine our energy policy based on the current and future needs of Canadian consumers - both individual and industrial. It is perhaps the most stunning and dramatic example of the abandonment of the national interest by any government in the history of Canada. But it is not just oil and gas that have been affected by our free trade relationship with the United States. The free trade imperative is now threatening to force deregulation of electricity as well. Our water is threatened by provisions in NAFTA that define water as a "good" and therefore tradable, opening up the possibility that U.S. water shortages will be met by the diversion of Canadian rivers. Canada's environment is increasingly threatened by the nearly total integration of the North American economy. Canada's ability to meet the requirements of environmental treaties has already been seriously compromised by a NAFTA case that successfully challenged our attempt to halt the cross-border movement of toxic waste. Since the signing of the free trade agreement the federal government has attempted to pass just two new pieces of environmental legislation. Both failed the free trade test and were, in effect, overturned by the provisions of NAFTA. It is impossible to know how many other pieces of legislation were considered by the government but rejected. The chill effect - declining to pass legislation for fear it will attract a costly NAFTA or WTO challenge - has crippled Canada's ability to pass laws and regulations to protect its own environment. For decades Canada occupied a unique and often very difficult terrain in the international field. A small country by population standards and dwarfed by the American colossus on its border, Canada nonetheless wielded the influence of a middle power much larger than its size would have suggested. We were once seen by developing countries and other smaller powers as a voice of internationalism and multilateralism. We often championed human rights and took a leading role in the boycott of the Apartheid regime in South Africa. Canada's foreign aid was generous and the Canadian International Development Agency had a reputation for taking a genuine interest in development issues. It was not just an agency promoting Canadian industry and foreign trade. Since the 1960s Canada developed and maintained a reputation for being a nation committed to peacekeeping, indeed defined the modern notion of that international role. The past 13 years of the new free trade relationship with the United States, in which Canada's commitment to free-market policies of economic globalization has increased, have witnessed a fundamental shift in Canada's foreign policy and its peacekeeping tradition. Right now, Canada has soldiers fighting in an undeclared war and the Canadian command has absolutely no say in directing them. They are not peacekeepers; they are not even Canadian soldiers. They are, in effect, American conscripts. If Canada was to go along the United States on the integration of Canadian forces under the new U.S. Northern Command, or on ballistic missile defense, Canada would squander the respect Canada gained within the international community for its stand on the Iraq war, reinforcing the image of Canada as a mere proxy for the superpower. Canada's generous foreign aid policy has been replaced by a diminished contribution to developing nations and an extremely aggressive trade policy that mimics that of the United States and is in complete support of the structural adjustment policies of the IMF and the World Bank. CIDA is now a shameless promoter of Canadian industry - including the nuclear industry - and has tarnished its reputation as a development agency. Canada, partly through deliberate policy shifts and partly because it feels it cannot risk offending what is now its almost exclusive trading partner, has become little more than an echo of American foreign policy interests. In the context of the new imperatives of the economic globalization, both sovereignty and democracy have suffered. Economic globalization has demanded of nations that they give up those aspects of sovereignty that allow for democracy. A nation's ability to regulate and guide economic development and the actions of capital are key to a nation's well-being in a free market system. The signing of the FTA and NAFTA have fundamentally altered Canada's sovereignty and its democracy. In order for Canada to create a "level playing field" with the United States it has systematically gutted its social programs, its progressive tax system, its commitment to industrial development, and its laws and regulations balancing the power of employees and employers. In order to accomplish this free trade objective, the Canadian and provincial governments and other political institutions have gone to great lengths to lower Canadians' expectations of democratic governance. Using scare tactics regarding the large deficits of the early 1990s, the deliberate misrepresentation of government employees, huge cuts to health and education budgets, and a relentless campaign to promote tax cuts, governments at all levels have convinced many Canadians that their values can no longer be reflected in government policy. It is not an exaggeration to suggest that as a result of this campaign, and the cuts to government services, democracy in Canada is in crisis. Unprecedented levels of cynicism and anger toward government and political parties have led to the lowest voter turn-outs in the country's history. The denigration of Canadian political institutions and democracy has been accompanied by a growing and alarming disregard for civil liberties and human rights in this country. Nowhere is the link between globalization and trade and the downsizing of democracy more obvious. The rapid Americanization of Canada's institutions and political culture demands both long-term and immediate action. Only by giving Canadians a genuine opportunity to engage in a dialogue about their country and its future direction can this alarming erosion of democratic participation and the resulting decline of the nation be halted and eventually reversed. The aftermath of September 11 taught us a great deal about how deeper economic integration has heightened our vulnerability. It reminded us that the Bush administration will not hesitate to unilaterally rewrite the terms and conditions of entry into its market, regardless of NAFTA; it will not hesitate to link our compliance with its security demands to access to the United States market. It reminded us that we have a border and that it matters. It reminded us that we are different and that our different laws and institutions are under siege. People are beginning to connect integration and loss of independence: NAFTA meant deeper economic integration and increased vulnerability which, with September 11, meant the Smart Border Accord, which in turn meant pressure for still deeper integration. To want to chart a different course does not imply a better course. This is not about moral superiority, or being anti-American. It is simply that we have different values and interests. We want to be able to reaffirm and preserve our founding myths, our historical experiences, and the values that have shaped and defined us. We want our laws and institutions to reflect our unique social character and our successful blend of individual and collective rights. We want to chart a course that affirms our highly original political experiment: our complex (tri-national and multicultural) federation with its long and extraordinary history of resolving tensions and conflicts peacefully. We also want, as we have in the past, to make our mark in the world: to help strengthen the fabric of international law, to advance world peace, social justice, democracy, and the environmental sustainability of the planet. In 1994, along with Mexico, Canada and the United States enact the North American Free Trade Agreement, aimed at eliminating tariffs on trade between the signing countries. Over the past decade, several other agreements were signed between these three countries. One of them was concernend with refugees. Formally signed by Canada and the U.S. in December 2002, the Safe Third Country Agreement stipulates that refugees must seek asylum in whichever of the two countries they reach first. The new rules would eliminate the practice of asylum shopping by refugee applicants by allowing their return to the last safe country from which they came. The agreement prevents asylum-seekers from using Canada as a “foot-in-the-door” to the U.S. or vice versa. Border official have subsequently said the new legislation will force more refugees to cross the border illegally. Bill C-11 was brought into force two weeks after the Sept. 11, 2001 attacks. It provides for a more thorough refugee screening process than previously used. Before the bill was passed, applicants would be photographed, fingerprinted and checked for a criminal record. If they seemed law-abiding and legitimate as applicants, they would be allowed into the country to settle while they awaited a formal hearing. A full criminal check wouldn’t be held until they were accepted at the hearing. Under C-11, the security check is done at the border. Under the new rules the applicant is interviewed up to five hours to determine if he or she is a genuine refugee. That’s followed by a security check by the Canadian Security Intelligence Service (CSIS). If there is any suspicion, the RCMP and FBI can be called upon for assistance. The entire process is to be done within 72 hours. If it is determined they are not a genuine refugee, or they fail the security check, they are deported. Otherwise they are allowed into Canada to await a formal hearing. Although Bill C-11 was in the works prior to the Sept. 11, 2001 attacks, it was implemented two months before being passed. Canada, the United States, and Mexico have agreed on a framework to implement the Security and Prosperity Partnership of North America. Both opponents and proponents of the agreement say that this is the most important step in the integration of North America since NAFTA was signed more than a decade ago. As liberal democracies, the three governments of North America also share common principles: protecting individual rights, upholding the rule of law, and ensuring equality of opportunity for their citizens. North America, in short, is more than an expression of geography. It is a partnership of sovereign states with overlapping economic and security interests, where major developments in one country can and do have a powerful impact on the other two. North America is also energy interdependent. In 2005, Canada and Mexico were the two largest exporters of oil to the United States. Canada supplies the United States with roughly 90 percent of its imported natural gas and all of its imported electricity. In March 2005, the leaders of Canada, Mexico, and the United States adopted a Security and Prosperity Partnership of North America (SPP), establishing ministerial level working groups to address key security and economic issues facing North America and setting a short deadline for reporting progress back to their governments. To that end, the Task Force proposes the creation by 2010 of a North American community to enhance security, prosperity, and opportunity. 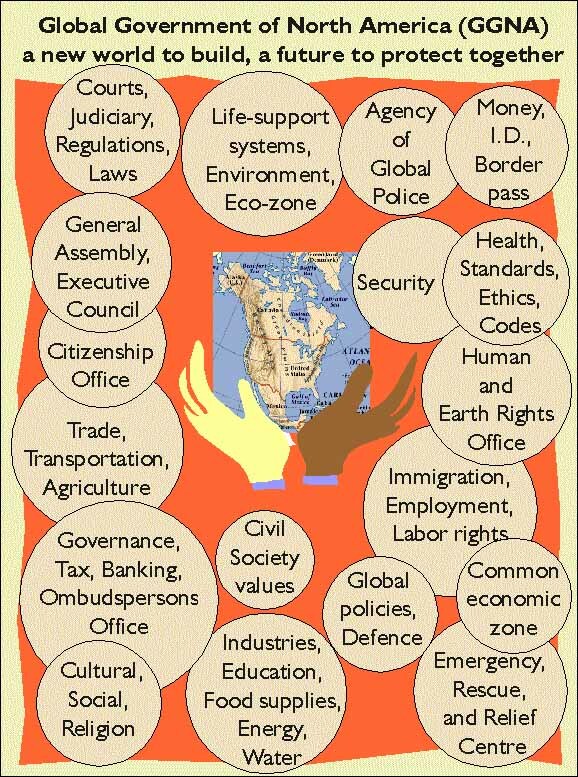 The Task Force proposed a community based on the principle that “our security and prosperity are mutually dependent and complementary.” Its boundaries will be defined by a common external tariff and an outer security perimeter within which the movement of people, products, and capital will be legal, orderly, and safe. Its goal will be to guarantee a free, secure, just, and prosperous North America. On the economic side, for instance, the initiative is aimed at both increasing productivity within the three nations and also at making their markets more competitive with the European Union and China. Joint undertakings could include standardizing some regulations on businesses, making it easier for business people to move across borders, increasing cooperation on energy exploration and moving toward a common external tariff for certain North American products sold to other economic blocs. A U.S.-Canada-Mexico task force has made some bold recommendations, including a North American border pass based on fingerprints or eye scans to speed border crossings. The Task Force on the Future of North America also advocated an "outer security perimeter" around the three countries, to be achieved by harmonizing visa and asylum regulations, integrating "watch" lists, conducting joint law enforcement training, setting up a "marine defense command" to protect North American ports and pursuing closer military cooperation with Mexico. In 1993, the United States, Mexico, and Canada adopted a labor side accord to the North American Free Trade Agreement (NAFTA), pledging to work toward broad improvements in the situation of labor rights in their respective countries. Seven years after the agreement entered into force, however, the record shows that the three countries have failed to live up to this commitment. While the accord, known formally as the North American Agreement on Labor Cooperation (NAALC), has suffered from structural defects from the outset, it nevertheless holds far greater potential to promote workers' rights and high labor standards than its limited use by the signatory states would suggest. Instead of exploiting this potential, the NAFTA countries have ensured the accord's ineffectiveness in protecting workers' rights. The NAALC, for all its deficiencies in practice, remains the most ambitious link between labor rights and trade ever implemented. It broke new ground by creating labor-related obligations and establishing sanctions for failure to fulfill them in certain cases. Under the accord, the signatories must ensure that labor laws and regulations provide for "high labor standards;" they must strive to improve those standards; and they must ensure access to "fair, equitable, and transparent" mechanisms for enforcing their labor law. The accord obligates the parties to effectively enforce their own labor law in eleven key subject areas, and stipulates that a "pattern of practice" of non-compliance (more than one incident) in certain subject areas could lead to the appointment of an outside panel of experts to recommend measures to resolve the problem. A "persistent pattern" of non-enforcement (a sustained or recurring pattern of practice) could lead to the convocation of an arbitral panel and the imposition of sanctions. As initially conceived and negotiated, NAFTA included no provisions to protect labor rights in its text or through a side agreement. The NAALC that was finally negotiated by Canada, Mexico, and the United States sidestepped thorny international political issues by avoiding any suggestion that it was intended to harmonize labor standards in the three countries, and by ruling out the establishment of multinational judicial processes or appeals procedures. Rather, it aims to promote broad improvements in the labor rights situation in the signatory countries, and it relies on political engagement between the parties as the means to address its violations. Nongovernmental organizations and individuals also play a part by signaling to the governments involved when the obligations established by the accord have not been met. The NAALC does not incorporate international labor rights norms; instead, it calls on the signatories to enforce their domestic labor standards effectively while working cooperatively with the International Labor Organization (ILO). Interestingly, the labor principles subject to NAALC consideration include a wider range of issues than the ILO's core standards, including protections for migrant workers and workers' compensation. The NAALC does not purport to resolve labor rights problems in specific cases. A worker unjustly fired for organizing a union in the United States, for example, could not expect a case filed under the NAALC to lead to job reinstatement. Fixing problems with the enforcement of laws designed to protect freedom of association, however, would fall squarely within the accord's obligations. Similarly, a Mexican worker victimized by an unfair labor tribunal could not expect a NAALC-based process to correct the legal deficiencies suffered in the case heard domestically, but could legitimately expect the pact to contribute to a general improvement in Mexico's labor tribunals. Even with these limitations, the NAALC has the potential to be a much more effective mechanism for promoting labor rights than it has been, in practice, to date. For example, if they had the necessary political will, the signatories could use the NAALC's framework to identify longstanding weaknesses in labor rights protections and develop comprehensive plans to remedy them. They could contribute to the development of labor law policy in their respective countries by promoting higher standards. And they could contribute to the wider international debate about how to link labor rights and trade. An important structural weakness of the NAALC is its lack of an independent oversight body. Thus, for example, if the United States violates one of its NAALC obligations, Mexico or Canada can either separately or jointly push for a remedy. In practice, however, in deciding whether to do so they are likely to also take account of other issues relevant to their bilateral relations with the United States, such as immigration, narcotics control, and the promotion of trade. So it is scarcely surprising that the NAALC's potential as a means for promoting respect for, and improvements in, labor rights has been dramatically underused. The NAALC signatories have taken advantage of the accord's silence on how to deal with allegations of non-compliance with its obligations. National Administrative Offices (NAOs), which were created in each signatory country to address instances of non-compliance, have complete discretion to determine which complaints to accept and how to investigate and report on them. Similarly, the accord sets out no standards regarding how labor ministries in the three signatory states should design programs to address instances of non-compliance with NAALC obligations. As a result, the governments have sometimes ignored issues raised by petitioners, reported on issues but then failed to include them in government-to-government talks, or included them in bilateral discussions but established no mechanism for remedying the problems identified. The accord permits the establishment of an outside panel of experts known as an Evaluation Committee of Experts (ECE) and an arbitral panel to address non-compliance with the obligation to enforce certain NAALC labor principles. However, it is vague on what to do when the accord's other obligations are not met. The obligation to have high labor standards, to strive to improve those standards, and to provide access to fair labor tribunals cannot by themselves be brought before such bodies. This constitutes a serious problem, because these obligations are fundamental to the ability of any government to enforce its labor law. In addition, the failure of a signatory government to enforce laws related to three fundamental labor rights-freedom of association and the right to organize, the right to bargain collectively, and the right to strike-cannot be brought before an expert committee or sanctions panel at all.